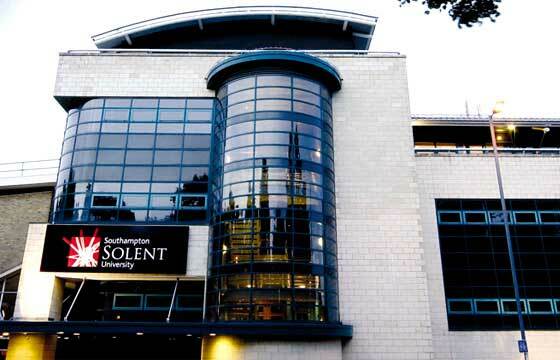 Southampton Solent University is one of the UK's newest universities, since we became a university in July 2005 and officially changed our name on 15 August 2005. The roots of Southampton Solent University can be traced back over 150 years. Although incorporated as an independent higher education institution as recently as 1989, the University's origins can be traced back to a private School of Art founded in 1856 which eventually became Southampton College of Art. Mergers with the Southampton College of Technology and, later, the College of Nautical Studies at Warsash saw the establishment of Southampton Institute in 1984. From a private School of Art to Southampton Institute, the University has seen many exciting changes. Since 1992 we've awarded more than 100 research degrees. Approximately 18,000 full-and part-time students.More than 2,000 international students from all over the world. Southampton is on the South Coast of England, just over an hour by train to London and within easy distance of Bournemouth, Portsmouth and Winchester. Its location makes it easy to travel to Europe either by ferry or from the city's airport at Eastleigh. Southampton Solent University is located in the heart of the city, which has grown dramatically into a busy, cosmopolitan centre of culture, entertainment, nightlife and shopping. Southampton Solent University offers more than 200 undergraduate degrees and almost 40 Higher National Diplomas and Foundation degrees, together with a wide variety of taught and research postgraduate degrees, professional education and short courses.The University provides a wide range of up-to-date facilities for use not only by our students but also our staff and external customers like library,sports,watersport activity etc.